Weebly is a cloud website builder, which has gained popularity with over 50 millions of users worldwide. It comes with integrated blogging and eCommerce engines and allows building these and other types of websites without the need to possess programming skills. The system features ease of use, but this does not mean that proficient web designers cannot use it to create large-scale blogs. Instead, Weebly grants this opportunity to everyone, irrespective of the web design expertise and creativity skills. Intuitive drag-and-drop editor of the website builder, its convenience and rich feature set have made the service one of the most user-friendly website builders available out there. However, is Weebly really so easy to use as it seems? Can it cover a broad spectrum of your web design skills or there is still much to be desired here? To answer these questions, let’s have a quick overview of the most effective Weebly blog samples. This will give you the idea of how functional and convenient the website builder is. 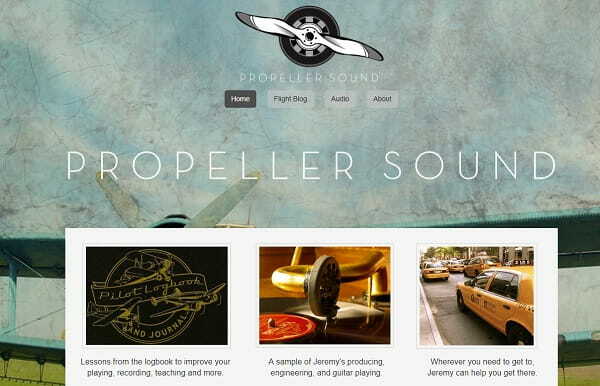 Propellersound.ca is a personal blog of Jeremy Johnson – a Toronto-based freelance music educator, musician, producer and engineer. Having great organizational skills, he has created this blog to foster the development of people as musicians and encourage guitar players to compose and record music. The blog is logically-structured and offers everything a musician may be interested in. There is a Music section with Jeremy’s favorite audio tracks as well as a Flight blog containing posts and resources to share the author’s experience. You can browse the archives to find articles you are interested in. The search filter section will simplify this process, saving your effort and time. The commenting option is enabled here, which allows sharing your thoughts with co-thinkers. This is a must-have feature for a blog. Quick access to social network buttons available on the left website panel is also of great help for users willing to join the author’s groups in the social networks. Leadapreneur.com is a website of the company that helps businesses boost employee productivity by upgrading them to the status of “agile digital innovators” known as leadapreneurs. This mission may seem somewhat awkward or not quite understandable for users, but the wide-screen video available at the homepage of the website helps clear up the situation. There is also a bright and detailed explanation of the entire process and its stages. Users get access to social network accounts and a blog section with multiple posts written and added by the team members. The commenting option is enabled here as well so that each reader could leave his/her impressions and thoughts about the article. If you are interested in other blog posts, you are welcome to browse the Archive section, where all the posts are divided into months for the ease of search. The blog is also available in the Spanish language. Callnetcorp.com is a provider of 24/7 nationwide live telephone and call center services. This is a nice choice for any business, which is involved in customer interaction, reservation and order acception, making sales calls etc. The company offers different types of plans based on the needs of clients. These plans are listed at the website, specifying the terms and prices they offer. The Abous Us info and the free trial option are available here as well. The Blog section comes with informative articles devoted to call center performance and the benefits business owners can get from it. The blog is updated on a regular basis and there is a commenting option, which makes it possible for users to share their opinions and leave their comments, if they wish to. Wetalkmoney.com.au is the Australia-based financial advertising company, which provides its clients with the unbiased and objective recommendations and advice without being sponsored by the third-party users. They claim that their financial recommendations are absolutely reliable and balanced. The website of the company is logically-structured. You can find out the most important information you are interested in as you scroll down the web page. The menu available in the left website panel grants access to the most important section, including a blog. The Blog Section is concise yet informative. It contains multiple posts that cover the most crucial topics users are mostly interested in. The blog is regularly updated, while the posts it contains are subdivided into thematic categories for the ease of search. There is the Contacts Section in the footer, which offers access to social media accounts, recent updates and CTA button, which makes it possible to get in touch with the company managers. If you are looking for a full-service wedding and event planning company or wish to launch the one of your own, Detailedengagements.com can become a decent example. The business is focused on planning and management of weddings and other types of events in the New England area. When browsing the website, you will find out more about the mission of the company and the services it offers. The Blog section, however, is a bit different. You won’t come across standard posts here, but you will be offered interesting articles about real weddings and events, specifying real facts, numbers, expectations and budgets. The blog is about wedding trends, bridal bouquets, attires and other staff website visitors are mostly interested in. The posts are divided into thematic categories and there is the archive with all the articles listed in the blog. 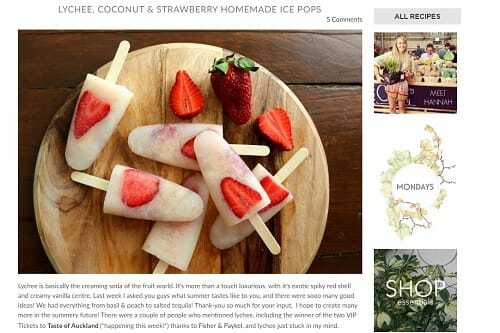 Healthyeah.co.nz is a foodie blog that has a beautiful design that we just couldn’t pass up. High quality, mouthwatering photographs, high resolution videos and white background make this Weebly blog pure eye-candy. The blog contains everything a gourmet needs to have thrilling cooking experience – informative articles, step-by-step recipes of the most delicious dishes, catchy photos and even the incorporated online store, where one can order advanced kitchen appliances and accessories. What’s more, each recipe comes with the comment section, where users can share their thoughts and ideas concerning the dish. All in all, the website is a nice combination of the blog and the online store. 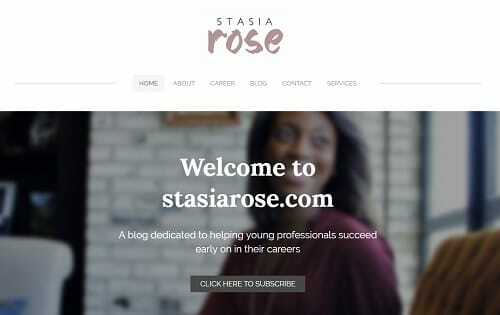 Stasiarose.com uses Weebly’s blogging engine to write about entrepreneurship, traveling, fashion and anything in between. Stasia’s website greets you with a clean, minimalist homepage and a sign up form asking her site visitors to join her newsletter. The sign up form contains Stasia’s photo and her personal invitation. These personalized elements help turn her blog readers into repeat visitors. Stasia used one of the simplest Weebly themes to create her blog. Its neat layout, elegant fonts and high quality images make the blog easy-to-navigate and read. The scrolling option makes it convenient to browse through the homepage, where lots of interesting blog articles are published. The author of the blog updates them on a regular basis, thus attracting new visitors. The list of the recently added posts as well as a rich choice of categories and archives are provided on the left panel of the homepage to keep users aware of the updates they may be interested in. These features make the website one of the best blog samples created on the basis of the Weebly platform! The neat design of Coldriversoapworks.com is definitely worth your attention. It’s all about the colors here. The presentation of each individual post and the overall layout of the website are neat and eye-pleasing. The design of the website is simple, but this simplicity contributes to the general impression the blog makes upon the users. It seems to be created for busy people, who do not have much time to browse through the website looking for the required products. The home page presents the major shaving and post shaving products with their general description. For those, who have the desire to place an online order, the site offers the “Shop Now” button that redirects the user directly to the brief, but understandable catalogue. This is the blog, where “the old world tradition meets American innovation”! Our exploration of these Weebly blogs examples was a really enjoyable experience. The Weebly users responsible for these sites should be applauded both for their devotion to share their experiences and views, and for establishing a creative, professional-looking and what’s more important – effective web presence. Are you a Weebly user? Then share with us your blog!